Batu, Siay ZSP- Parents are instrumental in the formation of children, they make sure their children are safe, healthy and in school. In the case of Batu, Siay in Zamboanga Sibugay, the tone is quite different. Batu known for its lush fields of Calamansi has been the park for children not for play but for labor. Such unpleasant reality has moved DOLE ZSFO to find a sustainable solution to put an end to child labor in Batu, Siay through its Child Labor Prevention and Elimination Program (CLPEP). 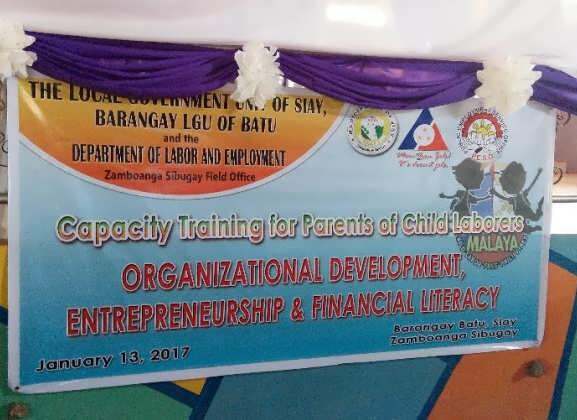 On January 13, 2017, DOLE ZSFO together with the LGU of Siay through its PESO arranged for parents of child workers to gather and participate in a Capacity Training that included sessions on Organizational Development, Entrepreneurship and Occupational Safety and Health (OSH). The one-day training started with the session on Organizational Development with Ms. Edyll Grace P. Poligrates, LEO III being the facilitator. The learning session gave emphasis on positive thinking and working together in harmony as an organization. Part of the training was for them to organize as an association that they aptly named "Batu Parents of Child Workers Association". Ms. Jocelyn V. Buen, Admin. Asst. III, facilitated the topic on Entrepreneurship, highlighting the characteristics of an entrepreneur. Lastly, Ms. Corazon Fatima P. Penaranda, LEO II, presented the Occupational Safety and Health that centered on the emerging OSH issues in the Informal Sector. In his welcome remarks, Hon. Jimmy S. Canete, highlighted on the concerted effort of the different government agencies to make Batu a Child-Labor Free Barangay. 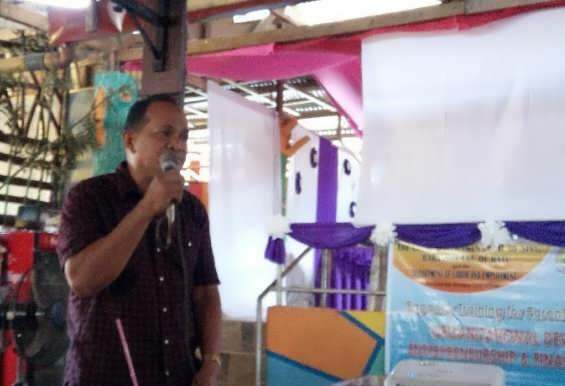 "I, together with the officers and constituents of Batu, with the support of DOLE and Siay LGU will make sure that Batu will remain Child-Labor Free in the years to come." The sessions, tailored to speak the language of the situation in Batu, resulted to an interactive training day. The parents exhibited eagerness to learn and found it empowering them to find suitable sources of livelihood to sustain their families and not expect their young children to do the hard labor. At the end of the day, children should be cared for, loved and assured a bright future. One day a child, free from hard labor, will be the catalyst that will bring change in the world. Batu, Siay ZSP has been certified Child-Labor Free Barangay last December 28, 2016 by the Department of Labor and Employment.